The Safe & Civil Schools Series is a collection of practical materials designed to help school staff improve safety and civility across all school settings. By so doing, school personnel lay a foundation to engage students and enhance learning. The goal of all materials in the series is to empower school staff with techniques to help all students behave responsibly and respectfully. The materials are full of specific "how-to" information. Though each resource stands alone, all are integrated and share some basic processes and beliefs. These processes and beliefs form a structure for procedures that help prevent students from "falling through the cracks" into school failure. 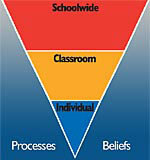 The graphic on the left shows the three levels as an inverted triangle with schoolwide procedures at the top. modifying schoolwide procedures is the best intervention. targeting classroom procedures is indicated. develop individualized plans as necessary. staff need to focus more time, effort, and energy on schoolwide and classroom procedures. The Safe & Civil Schools series includes materials and resources that encompass all levels depicted in the triangle—schoolwide, classroom, and individual student. The following resources are available through our publishing partner Ancora Publishing. Foundations: Establishing Positive Discipline Policies, considered the cornerstone of Dr. Sprick's Safe & Civil Schools Series, is a comprehensive, multimedia program that guides staff through the process of designing a positive and proactive schoolwide discipline plan. The program lays the groundwork for using data to inform decisions on developing and implementing effective behavior management and positive behavior support of all students. Foundations consists of six modules, each of which includes video presentations and corresponding print material. START on Time! Safe Transitions and Reduced Tardies is a multimedia inservice program for middle and high school settings designed to create safe hallway transitions and reduce tardiness schoolwide. Schools implementing START on Time! have seen up to a 90 percent reduction in tardies. Leadership in Behavior Support is written specifically for building administrators (principals and assistant principals) on how to guide staff in the development and implementation of proactive schoolwide policies and procedures. It also addresses how to deal effectively with disciplinary referrals and how to support teachers and students when chronic or severe misbehavior occurs. ParaPro: Supporting the Instructional Process is an excellent resource for providing noncertified staff with the information and training they need to effectively manage student behavior in the settings they supervise. Covered topics include being part of the school team, managing small group instruction, helping in a classroom, supervising common areas, and working with an individual student. CHAMPS: A Proactive and Positive Approach to Classroom Management, 2nd ed. is a comprehensive and practical book for classroom teachers who want to improve their current classroom management plan. The nine chapters lead teachers through a process of identifying and maintaining the effective aspects of their current management plan while adding and/or strengthening any missing or less-effective aspects. This resource, which is designed to be used by individual teachers or study groups, can help any teacher manage student behavior more positively and effectively. CHAMPS DVD Inservice Series, 2nd ed. contains everything necessary to facilitate a class or study group on the CHAMPS book. Ten fast-paced film presentations bring the book to life, while the accompanying print materials provide the structure and tools needed to guide groups in discussion and self-assessment activities. The new DVD format allows easier access to key points in each presentation. The program includes six DVDs, two copies of CHAMPS, and a Facilitator's Manual. CHAMPS Teacher Planner is a practical, easy-to-use spiral-bound lesson planner with CHAMPS classroom management tools and tips embedded within the structure of a typical teacher planner. CHAMPS activities help teachers observe, reflect, and improve classroom management practices all year long. Use the planner alone or as a review of the procedural knowledge learned from reading the CHAMPS book. Coaching Classroom Management, 2nd ed. is a must-read for anyone who works directly with teachers to improve classroom management techniques. The tools in this book were field tested to close the gap between the ideal of research-based practice and actual implementation. Coaching Classroom Management, 2nd ed. contains observation forms, staff development materials, checklists, rating scales, tip sheets for classroom walkthrough, tips for working with reluctant teachers—everything you need to implement effective coaching. Discipline in the Secondary Classroom, 2nd ed. is an easy-to-use, research-based resource that supplies high school teachers with the step-by-step guidance they need to design an effective behavior management plan. The book describes proactive, positive strategies for curbing misbehavior and increasing student motivation. It includes forms, samples, and evaluation tools to aid in the effort. Discipline in the Secondary Classroom DVD Inservice Series is an exceptional program developed to complement the second edition of the Discipline in the Secondary Classroom book. This 5-DVD set guides and supports your secondary school staff in the design and implementation of practical, positive classroom management plans. It includes a Facilitator's Guide and two copies of Discipline in the Secondary Classroom, 2nd ed. with reproducibles. Teacher Planner for the Secondary Classroom is a practical and versatile lesson planner that will help you stay on top of paperwork, maintain important records, and create a classroom atmosphere that is both supportive and disciplined. SMART Kids: Social Grace, Manners, And Respectful Talk is a curriculum to teach young children social graces, manners and how to talk respectfully. The 18-unit program includes direct instruction lessons and age-appropriate activities and games. Lessons incorporate how to provide explicit instruction, role-playing, puppet play, and repeated practice in natural contexts. SMART Kids: Social Skills Posters reflect the skills taught in each unit of SMART Kids. Each SMART poster illustrates a Social Story from the book that provides students with the specific behaviors that demonstrate that skill. Stepping In: A Substitute's Guide to Managing Classroom Behavior is a practical guide that prepares substitute teachers to effectively deal with student misbehavior. Substitutes learn how to prepare for a subbing assignment, gain the respect of students, handle discipline problems with minimal disruption, and implement behavior management strategies that motivate students. Structuring Success for Substitutes: A Guide for Administrators and Teachers is a companion volume to Stepping In that will help administrators and faculty develop a schoolwide Substitute Teacher Development Plan. Worksheets help staff design lesson plans and a Substitute's Notebook that provides the essential information a substitute needs before stepping into a classroom. Teacher's Encyclopedia of Behavior Management is an indispensable tool for all elementary, middle, and high school personnel. It offers practical solutions to more than 100 common classroom problems. For each problem covered, there are three to seven detailed intervention plans that teachers can choose from or modify to fit their particular situation. This easy-to-use reference is arranged alphabetically and includes an extensive index as well as cross-indexing among the problems. When Every Second Counts is a unique DVD inservice set. Listen as Dr. Randy Sprick guides your staff through nine focused discussions on common problems that detract from instruction and learning. Mini-Inservice sessions (conveniently designed for either 15- or 30-minute implementation) conclude with targeted tips from Dr. Sprick. This set includes a CD with reproducible Notes for Facilitators and forms for staff. Behavioral Response to Intervention: Creating a Continuum of Problem-Solving and Support gives educators information about how to create a continuum of support at district, school, and individual levels to meet the behavioral needs of all students. The book presents a proposed model for organizing a service-delivery structure in a time-, personnel-, and cost-effective manner. Behavioral Response to Intervention includes a CD with more than 30 reproducible forms, all enabled for type-in entry on your computer. Interventions: Evidence-Based Behavioral Strategies for Individual Students, 2nd ed. is a comprehensive resource for planning and implementing validated, tiered strategies to increase motivation and improve behavior. Based on a response to intervention (RTI) model for behavior, the book demonstrates how to use data in decision making, how to apply targeted, evidence-based interventions, and how to evaluate the results. The 19 chapters in this book discuss different evidence-based interventions, with information on implementation, sample forms, charts, and data collection tools. The book includes a CD with reproducibles. Interventions Audio, 2nd ed. complements the Interventions book with informative and entertaining staff development. Listen to Dr. Sprick�s practical descriptions of how to design a plan and implement the 19 interventions from the book. Managing the Cycle of Acting-Out Behavior in the Classroom provides practical and safe strategies for managing and preventing challenging behavior (e.g., defiance, threats, resistance, avoidance, and disruption). Each chapter is filled with comprehensive strategies to help educators intervene before behavior escalates beyond control. PASS—Positive Approach to Student Success is an effective program that helps school staff serve students with serious emotional disturbances in the general education setting. PASS staff provide targeted, intensive social instruction, behavior monitoring, and coaching support for both student and general education teacher. The program assists students in developing self-management skills and relies on data to drive decisions. Safe & Civil Schools uses the inverted triangle image to illustrate the methodology behind our training. Educational practice often results in spending a great deal of time, energy, and money on those individual students who act-out most intensely — the tip of the triangle. By inverting the image, we hope to stress the importance of placing your time, energy, and money on all students first — the widest part of the triangle. Create a school climate that is calm, civil, and structured for student success. In a positive and proactive atmosphere, individual students will actually require less of your valuable intervention resources. All school settings should be organized to promote successful behavior from students. You may download a PDF of this overview here. Watch as Dr. Sprick explains the Safe & Civil Schools approach to behavior management.